Brakes are an important part for the safety of your vehicle.Brakes are an important part for the safety of your vehicle. 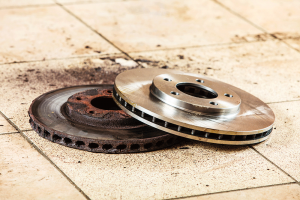 The brake system of your vehicle should be inspected regularly. Regular maintenance checks for your vehicle will help it to stay in the best condition possible. If you do not bring the vehicle in, you will not know what is wrong with the vehicle until it is too late. Noticing an issue at the first sign can help reduce further problems from forming with your vehicle. Anything out of the norm should always be taken seriously, and not ignored. This will help you to save time, money, and stress in the long run for your vehicle. Noticing a brake issue can sometimes be more difficult. Some signs are issues you notice with the brake pedal. This can include the pedal too soft or too hard when you apply it. Spongy brakes will result in the brake pedal needing to be pushed all the way to the floor. This can make applying the brakes more dangerous, because the response time will be decreased. You may also notice that there is a vibration feeling when you apply the brakes. This means that parts are starting to wear with one another and need to be looked at. You may also notice a leak under your vehicle. It is important to park your vehicle in a dry spot, then back out to make sure it was your vehicle that had the leak. Since it could be one of several fluids from the vehicle, bring it in. We can check the oil, brake fluid, and the other fluids to figure out where the leak is coming from on your vehicle. By doing this, you can help improve the reliability and safety of your vehicle when you drive it. We can do a bumper to bumper inspection so that if there is something out of the norm with your vehicle, it is fixed quickly. This entry was posted in Auto Repair, Brake Repair, Brakes, Car Care Tips. Bookmark the permalink.